Resource for waterfowl identification and information, including specific duck and goose species identification, waterfowl size comparisons, U.S. flyways, links to waterfowl products and articles on related websites. Resource for dabbling or puddle duck identification information, feeding and takeoff patterns, eclipse plumage, and other pertinent information. Resource for diving duck identification information, feeding and takeoff patterns, eclipse plumage, and other pertinent information. Resource for goose or geese information, identification, and product links to other goose and goose hunting websites. 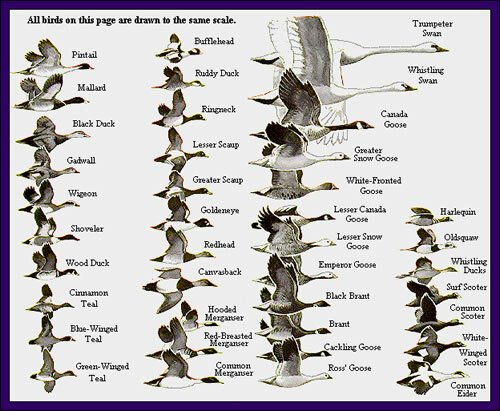 This chart is a helpful tool for inflight identification of various species of ducks and geese. All sizes shown are drawn to the same scale. Combined with other information shown in this section for individual species, accurate identification will be much easier. The term "flyway" has long been used to designate the migration routes of birds. For management purposes, four waterfowl flyways - Pacific, Central, Mississippi, and Atlantic - were established in the United States in 1948. To varying degrees the waterfowl populations using each of these flyways differ in abundance, species composition, migration pathways, and breeding ground origin. There are differences, also, in levels of shooting pressure and harvest. For the most part flyway boundaries follow Sate lines. 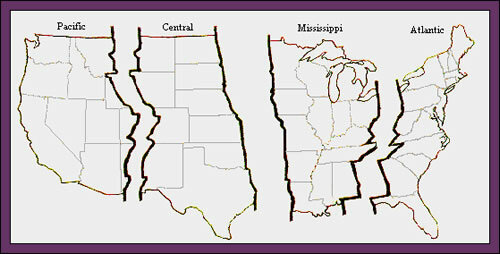 However, the boundary between the Pacific and the Central flyway generally follows the Continental Divide. There are some problems in matching waterfowl migration corridors with flyway boundaries because some species nest and winter in areas that do not occur along a north-south axis. These species cross flyway boundaries during migration. There's more than just ducks and geese in our marshes and wetlands. Knowing and identifying other birds and animals add to the enjoyment of being in a blind. The same sources of food and shelter that draw waterfowl to ponds and marshes also attract other forms of wildlife. Protected species are sometimes more numerous than ducks or geese. Preserving and protecting these areas for ducks, geese, and all wildlife add to the enjoyment and pleasure of hunters and non-hunters alike. Source: Hines, Robert W. Ducks at a distance: A waterfowl identification guide. U.S. Fish and Wildlife Service, Southwest Natural and Cultural Heritage Association, Albuquerque, NM.